Just can't get enough. 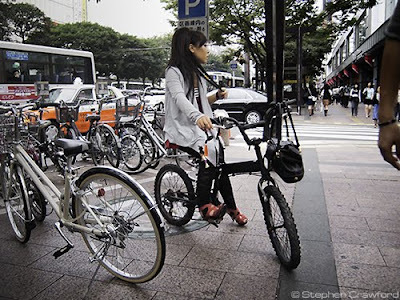 Here's another installment of Japan Cycle Chic from my mate Stephen Crawford, the photographer living in Fukuoka City, Japan. The perfect respite from a cloudy Sunday afternoon. The stylish cyclists of Japan are, in my opinion, second only to their counterparts here in Copenhagen. Beautiful looking Women very small and Neat. The Saddles seem to be set ridiculousely Low ,very Tiring on your Legs and Back. I think the focus is here on CHIC, not on CYCL(E)ING. If SUV is chic you will see them in a SUV, I guess. Their seats are too low! That looks so painful. Is there some reason why women must ride improperly fitted bicycles while looking chic? Couldn't practicality enter into this, or would that interfere with the fantasy? Very low saddles aside, why do Japanese women always leave me feeling somewhat lacking. They just look smarter and cooler than I'll ever be. Oh, well. I need to always aspire to something.